The New York Times Company is planning to make money by selling in-person access to a key official in Iran's oil ministry. A Times staff member, Brenda Erdmann Hagerty, sent an email Friday soliciting sponsorships and selling tickets to the conference, which is set for October 6 and 7 at London. 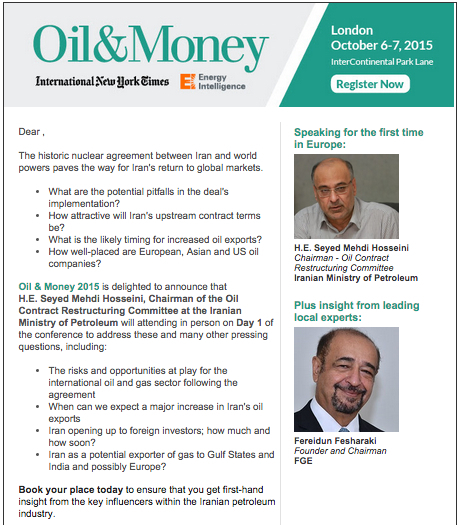 The email, a copy of which was obtained by SmarterTimes.com and which is reproduced below, pronounces the Times "Oil and Money" conference "delighted to announce that H.E. Seyed Mehdi Hosseini, chairman of the Oil Contract Restructuring Committee at the Iranian Ministry of Petroleum, will be attending in person." 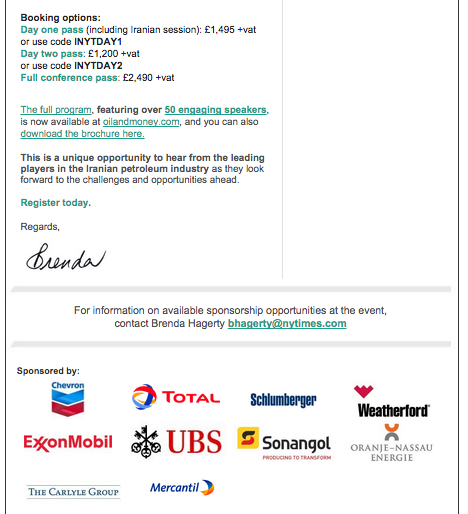 Admission to the conference and to a "Petroleum Executive of the Year" dinner honoring ExxonMobil CEO Rex Tillerson costs $4,091 including tax at current exchange rates, though the Times is offering some promotional codes beginning with "INYT," for International New York Times. The conference venue is the InterContinental Park Lane London, which conference organizers tout as "the epitome of modern elegance." On a per-day basis, the $4,091 price for the two-day London event is even pricier than the $6,995 that the Times has been charging for a 13-day tour of Iran guided by a Times journalist. The conference promotional material suggests that something of high value is on offer: an inside track on investing in Iran's state-controlled oil and gas resources, which had been off-limits to Western companies because of sanctions related to Iran's nuclear weapons program. "Iran opening to foreign investors, how much and how soon?" the conference invitation email from Ms. Hagerty says. "Book your place today to ensure that you get first-hand insight from the key influencers within the Iranian petroleum industry." The news that the Times is selling $4,000 tickets for face time with Iranian oil decision makers at a fancy London hotel is likely to trigger criticism at a moment when a reporter of the Washington Post, Jason Rezaian, is languishing in a Tehran prison where conditions are known to be considerably harsher than at the Park Lane. Even advocates of the Iranian nuclear deal such as President Obama have acknowledged the "likelihood" that Tehran will use some of its post-sanctions-relief revenue to fund terrorist groups such as Hezbollah and regional military adventurism. The Iranian government remains on the State Department's list of sponsors of terrorism and its human rights abuses are well documented, as are its anti-Semitism, Holocaust denial, and assistance to forces that killed American troops in Iraq. The list of high-profile American firms that are sponsoring the Times-hosted-and-convened conference include Chevron, ExxonMobil, and the Carlyle Group. The agenda for the two-day conference does include one session devoted to "the impact of global climate change policy," but no environmental groups are listed as sponsors and none of their representatives are listed as speakers. The Times conference web site promises potential sponsors that "The Times can deliver on a wide variety of goals— thought leadership, V.I.P. client treatment, generating borrowed interest via media (print, online, social), introductions to individual delegates." The conference is slated to begin with a welcome from Stephen Dunbar-Johnson, a New York Times Company executive whose title is "president, International." A press release for the conference and announcing Mr. Tillerson as the 2015 "petroleum executive of the year" lists two New York Times employees as media contacts. Established news organizations have been expanding into the conference and events business as more traditional revenue streams such as print advertising and subscription sales have declined because of the Internet. But the business can be perilous from a reputation perspective; the Washington Post's plan to sell access to "salons" at its publisher's home was denounced by that paper's ombudsman as "an ethical lapse of monumental proportions." Journalistic ethics watchdogs have yet to weigh in on the propriety of the Times plan to sell access to an Iranian oil official so soon after it has been editorializing in favor of President Obama's effort to bring Iran sanctions relief. Critics of Iran or of the oil industry, which has been targeted for divestment by campus climate-change activists, also have yet to weigh in. The one conference session that focuses on geopolitics includes as a panelist Alastair Crooke, whose conference bio touts that he has "has 20 years of experience working with Islamist movements, particularly Hamas and Hezbollah as well as other Islamist movements in Afghanistan, Pakistan and the Middle East." A 2009 profile of Mr. Crooke in Mother Jones spoke of "the weirdness of Crooke's embrace of even the looniest doctrines of the Iranian ruling clique."